Ramakrishna Paramhansa is perceived to be one of the most popular and important saints of India during the nineteenth century. He was also one of the great persons who inspired and shaped the life of Swami Vivekananda, another great monk of India. 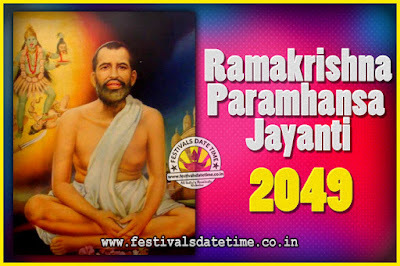 Ramakrishna was born on 18 February 1836, in the village of Kamarpukur, in the Hooghly district of West Bengal, into a very poor, pious, and orthodox Brahmin family. The Hindu calendar mentions the birth date of Ramkrishna Paramahamsa as Dwitiya during Shukla Paksha in the month of Phalgun. The Birth anniversary of Saint Ramkrishna is celebrate as per the date in accordance with the Hindu calendar in all the established Maths of Ramkrishna cadre. In 1855 Ramkumar was appointed as the priest of Dakshineswar Kali Temple, built by Rani Rashmoni, a rich woman of Kolkata who belonged to the kaivarta community. Ramakrishna was a priest in the Dakshineswar Kali Temple and attracted several monastic and householder disciples.